Cor, that's a lot! I'm duly honoured by each and every one of these blogroll links, so many thanks to you all. Why not click on some of these 202 links to see what you're missing. Not all of them, obviously (unless you're especially bored), but maybe 10 or so. Pick them at random, or pick the ten with the most interesting names, or start somewhere in the middle and work your way backwards. I can't guarantee that every single blog listed here is a literary masterpiece, but most are dead interesting. I know - I've had to read them all over the last couple of days, just to check that they're still being updated. I compile this list every year, so I started by checking all 200+ blogs on last year's list to see how many of them still linked here. About one in three have fallen by the wayside and don't appear this year. Some have just vanished - disappeared, deleted - which is a pity. Some are now on hiatus - either deliberately, or through month-long neglect - which is a shame. And a few are still going strong but have removed me from their blogroll - zapped, extinguished - which I guess is the way it goes. Still, at least several new blogs have come along and added me instead, so I'm not losing out completely. Which is nice. I've always tried to keep my blogroll manageable - 20 sites max - although I'm aware that this means I don't link to as many other blogs as I could/should. So today's post is a small way of making up for that omission. I hope it's a fairly complete list, courtesy of Technorati and various other useful web services, but I bet it isn't. Let me know if I've missed you/anyone off the list. I fear Britain's national meal is changing. Not so long ago, Britain's national meal was probably roast dinner. Roast beef, most likely, sliced thinly and served up with plump roast potatoes and various spoonfuls of veg, all covered in thick brown gravy with a dollop of horseradish on the side. The perfect roast beef dinner would be served up by Lynda Bellingham, or an OXO-crumbling Mum very much like her, and ladled out every Sunday to a smiling family sat round a bountiful dining table. Not so long ago. Apologies to my vegetarian readers, because sliced cow has never been your meal of choice, but this is Britain we're talking about, and our carnivorous nation isn't averse to flesh-eating. Or maybe Britain's national meal was fish and chips. Plump white cod fried to within an inch of its life in thick crispy batter, packed together with a mountain of greasy thick chips, unwrapped from a semi-transparent fat-stained sheet of newspaper. The perfect fish and chip supper would be served up on a Friday night fresh from the chippie, saving Dad the washing up, and sprinkled liberally with brown malty vingar and a splodge of artificially red ketchup. Apologies to my vegan readers, because murdered fish has never been your meal of choice, but this is Britain we're talking about, and island nations don't mind a few bones between their teeth. More recently, I suspect Britain's national meal evolved into Chicken tikka masala. A meal so convincingly Indian that legend tells it was probably invented in Glasgow. De-feathered meat from battery farm hell, already pre-chunked to save effort should you choose to hurl it all up later. The perfect Chicken tikka masala would arrive in a thick liquid gloop that'd stain your carpet orange should you spill a drop, and stain your intestine orange if you didn't. With added rice and naan for good measure, this modern multicultural classic used to be very popular indeed. Apologies to my non-spicy readers, because I can't see what the attraction is either, but this is Britain we're talking about, and there's no accounting for national taste. But now there's a new favourite meal out there. It's taking hold first in the younger generation - generally those with only a few quid in their pocket, an empty life and plenty of independence. It's quick to cook, easy to get hold of, and extremely portable. It slips off the fingers with ease, and it slips down the throat in seconds. You can see the evidence on the streets - generally littered all across them. It's Chicken-In-A-Box. And it's everywhere. Apologies to my under-25 readers, because some of you would rather stick pins in your eyes than eat this stuff, but this is Britain we're talking about, and lowest common denominator food rules. As cheap and nasty fast food goes, there's little to compete with Chicken-In-A-Box. Take the very dodgiest scrapings of scrawny poultry, recombine the bits in over-salted water, squash everything together in a greasy overcoat of soggy batter, and heat the lot in a reservoir of cardiovascular poison. Serve with a liberal portion of thinly chopped potato sticks, similarly fat-soaked, and dump into a cardboard box topped off with artificial squirtings of slimy red sauce. Throw in a can of sugared fizzy water for good measure and there you have the lunchtime option of choice for many a school dinner refusenik. No wonder the nation is in the grip of an obesity crisis. Apologies to my larger-framed readers, because your bulky belly is obviously hereditary and not in any way a reaction to excess diet, but this is Britain we're talking about, and our national waistline is rapidly heading States-size. Britain's national meal has never been healthy. Roast dinners are oversized platefuls of lardy stodge (though usually accompanied by dollops of tasty veg). Fish and chip suppers are two healthy ingredients irrevocably tarnished (though sometimes with added Omega 3). Chicken tikka masala is little more than arterial glue (though probably with real tomatoes, if you're lucky). But, unlike previous comfort food classics, Chicken-In-A-Box has no redeeming features whatsoever. It's a cheap and nasty gut-filler for the can't cook won't cook generation. It's a cop-out meal, served up by grease-vendors, to palates that know no better. And it's being eaten daily to excess in a High Street near you. Beware the ubiquitous orange box, and be finger-licking afraid. Apologies to all my readers, because some of you probably have a really nice healthy lunch planned, but this is Britain we're talking about, and the future is reconstituted meat and heart disease. What happens when Dragon's Den features a company with a very similar name to your blog? 11:24am First indications of unusualness arrive via an email from the owners of the Diamond Geezer diamond trading website. It's a very pleasant email, alerting me to the fact that they're on Dragon's Den this evening and I might like to watch, and not in any way promotional. 8:36pm Reply to email, wishing them luck. It's strange finally communicating with the 'other' Diamond Geezer website, the one that's higher up Google that I've managed to clamber. 1) It may be a Batman film, but nobody goes ZAP! KAPOW! or ZONK! Sorry, I know you enjoyed the 1960s TV series with Adam West as the Caped Crusader, but it's not camp and fantastical like that at all. This Batman is dark, serious and intense. There's not even a Robin for heaven's sake. Holy Absentee! 2) You might want to consider taking emergency rations. It's a very long film, just over two and a half hours, and most people ran out of giant popcorn well before the middle. 3) Move along one from the seat you think you want to sit in. That'll leave a gap of only one, not two, which'll stop the pair of fat latecomers from squeezing past and wrecking your legroom. 4) Suspend disbelief. Lots of utterly ridiculous things will happen (like falling off skyscrapers and an unfeasibly long car chase) and will be taken very seriously. Yes, I know that's how action comics work, but it pays to be prepared. 5) The distributors haven't made a big fuss of this being a sequel, but it is. You might want to watch Batman Begins before you go, because then a few unspoken hints in the utterly convoluted plot might make sense. 6) Bang! Dead. Bang! Dead. Bang! Dead. Be warned that there are a heck of a lot of senseless deaths throughout. London's suburbs aren't yet anywhere near this bad, whatever the press and media might suggest. 7) Heath Ledger's going to get nominated for an Oscar for his role as the unhinged Joker. You might not agree with that, but watch out for the bit where he walks away from an exploding hospital because I bet they show that at the ceremony. 8) You might want to warn the snogging couple three rows in front of you not to sit there. Two of the cinema patrons to their left have very weak bladders and will interrupt all the good bits by walking past, twice, each. 9) It's not a very Batman-centred film. Many of the supporting roles have a lot more plot time and screen presence. Christian Bale's a bit dull really. 10) You could walk out fifteen minutes before the end. You won't, obviously, but trust me, it's the weakest bit of the film and you could. Four years from today, less than a mile from where I'm sitting, the opening ceremony of the 30th Summer Olympic Games will take place. Four years might sound like a long time, but it's not. There's no stadium as yet, which is perhaps not surprising given that this time last year the site housed several warehouses and the odd factory. But come 2012 there's got to be a huge circular grandstand erected around a mighty arena, otherwise there'll be nowhere to let off the balloons and fireworks. And somebody's got to build it. Every month since the Olympic Park was sealed off, I've been up onto the Greenway bridge to take a same-angled photo. This month an extra crane has gone up, and all the surrounding land has been flattened and compacted to make terraces suitable for building. Marshgate Lane has been diverted, obliterated even, to be replaced by a new orbital distributor road for construction traffic. But the most striking change I saw wasn't on the Olympic stadium site at all, it was up on the Greenway, and it was walking home. The Greenway's always been a fairly quiet footpath, bar the odd boy racer on a stolen moped, but no longer. Come half past five in the evening it's suddenly become a hive of commuter activity. No really. I stood to one side as a steady drip of men in suits, women in heels and workmen in boots wandered by, fresh from clocking off. The construction phase has begun, and now there's work to be done. Two great big temporary office blocks have been erected on the edge of the Olympic site, and their pedestrian access is via a long walkway to the Greenway. It's suddenly clear why the ODA have been so keen to keep this sewer-top footpath open during the construction period - it's the main route between the site office and the nearest DLR station at Pudding Mill Lane. And I suspect this also explains the expense spent on installing shiny new streetlights (but only along this northernmost stretch of the Greenway and not along any of the rest yet). Another unexpected feature was a new pedestrian crossing at the bottom of the ramp beneath the railway arches. It's unlike any I've ever used before. It has lights and push buttons and green men and everything, but this area is so health and safety conscious that the whole length of the roadway is securely fenced off, even the crossing. Wait patiently and the two waiting wardens will press the button for you, stop the traffic and open their gate to let you across. Sigh, I remember when this particular stretch of Marshgate Lane was just a threateningly-quiet dingy tyre-strewn dead end, wholly suitable for fearless independent travellers. 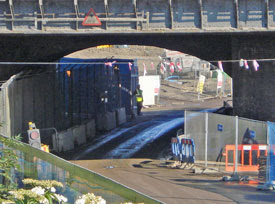 Now it's the main through route for Olympic lorries, dumper trucks and construction vehicles, unnavigable without assistance, and requiring a permanent staff of two lollipop men to keep the commuter stream moving. Who says the Games haven't created worthwhile jobs for local people? Not everybody takes the DLR home, some take the bus. Road traffic on the Olympic Park has recently been boosted by a host of shuttling minibuses, each labelled "Team Stadium" to ensure that employees end up in the correct location. This is a vast construction site, so a complicated transport network has had to be established to move the workforce around and to keep them away from the underside of passing steamrollers. The ODA are even using bendy buses, painted white, to ensure sufficient passenger capacity. I noticed that one such articulated monster still has the number 453 on the back, so maybe this is where Boris is hiding all his bendies until he gets his new pseudo-Routemaster sorted out. 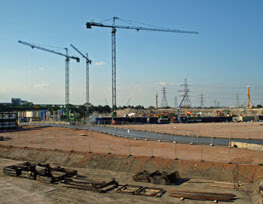 So what can we expect to see in the Olympic Park over the next year as "The Big Build" commences? The ODA are committing themselves to ten new milestones, including the pledge that "the foundations of the Olympic Stadium will be complete" and "work on the upper seating structure and roof will be underway." I'm cheered to see that "the overhead pylons will have been removed", but considerably less thrilled by the promise that "the erection of the new perimeter security fence will be underway". I expect to see something even less inviting than the blue wooden wall that currently encircles the site, incorporating razorwire, sheer concrete barriers and CCTV cameras. But all essential, alas, if the Queen is ever to stand on this building site and announce to a worldwide audience of two billion that London is where it's at. Four years and counting. It was the jaffa cake on the escalator that first alerted me. Escalators should always be cake-free, and indeed object-free, given their repeated circuitous motion. This, then, was a freshly-dropped jaffa cake, sitting chocolate side up on the metal slats. I wondered briefly, as I stepped carefully past, whether it might survive to the bottom intact or whether some other passing footstep would squelch the orange-y bit completely flat. More importantly, however, I wondered how the jaffa cake might have appeared here in the first place. And then I hit the milk. One moment I was striding confidently down the escalator, holding onto the rubber rail in line with current safety guidelines, and the next my left hand was covered with white sticky white dampness. Yeee-ugh. The slimy trail continued for a few more unpleasant centimetres, and then I pulled my fingers away to walk on unsupported. That looked like the spillage culprit a few steps below. A man with lank mousey hair and a thick blue jacket, clutching something edible tightly in front of him and lumbering unsteadily downwards. Not the best place for a fast food meal, I thought. He reached the foot of the escalator before me, wobbling unsteadily, and headed off towards his train. I spotted the telltale upturned blue lid of a milk carton on the lowest step as I alighted behind. 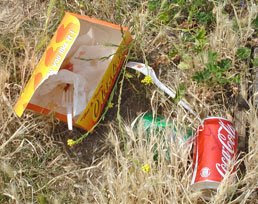 Oh great, I was walking behind a ravenous passenger intent on scattering his remnant leftovers anywhere and everywhere. I sped up, attempting to overtake him along the passageway to the platform. As I passed I noticed the unmistakable whiff of ingrained filth erupting from his unwashed torso. This was the kind of man who'd reek even in the middle of winter, but on the hottest day of the summer his fetid aura was all-pervasive. All this plus a little extra dab of milk. I walked a little faster to reach the uncontaminated air ahead. I made sure I stopped just far enough up the platform to be safe, and looked back to watch my pasteurised nemesis shuffle to a halt. He made for the one remaining seat on a bench of four and settled back to finish off his meal. Alcohol might now be banned on the tube, but there are no such regulations against cow juice and cake. I noted the man's thin feral face, revealing rather too much cheekbone, as he stuffed down yet another jaffa from his plastic stack. Two smart young ladies, who'd previously been enjoying their chat unmolested, looked briefly at one another and rose silently to evacuate their endangered resting place. Ignorant of being shunned so politely, the stooped diner munched on. With the next train now rumbling in the distance, an elderly couple then took the opportunity to rest awhile on the newly vacated seats. They didn't last long, but still probably several distasteful seconds longer than they'd have liked. As the doors opened, the source of all our discomfort remained resolutely still, fiddling in his bag and gulping down a few more milky mouthfuls. I thought travellers to Hainault (via Newbury Park) might be safe from the inescapable discomfort of radiating body stench in a confined space, but no. At the last second the hungry hunchback arose, spilling more white liquid, and lumbered purposefully into the train. By now I was, thankfully, safely tucked away in the carriage nextdoor. But my thoughts were with the nasally-assaulted passengers through the connecting door, doomed to travel in stinking jaffa cake hell. Commuting can be so wonderfully random sometimes, but random is not always wonderful. Yesterday you got the words, today you get the pictures. You could just head over to Flickr and view them all there in sequence, but experience suggests you probably won't. So I'm going to give each of the 30 photos a little plug here, and then maybe you might click through and view the ones that sound interesting (or I might trick you with weasel words into viewing something mighty tedious - your risk).  Windsor: The castle before the tourists arrive; The castle after the tourists arrive; The Union Jack flying (so Her Maj was out); View from the bridge over the Thames (with wheel).  Eton: Filming in the High Street (proper camera crew and all); Barnespool Bridge (pretty in pink); A "25 miles to go" plaque commemorating the 1908 marathon on a wall at Barnespool Bridge (wow, who'd have thought 100 years later? ); Eton College's 'School Hall' and 'School Library'; Eton College Chapel (from a distance); The Playing Fields of Eton (with cricket pitch flattener).  Slough: Shoppers and birdy sculpture in the High Street; Wernham Hoggs (don't get your hopes up, Office fans); Hilariously incorrect road markings (well, OK, quite amusing).  Uxbridge: The boutiques of Windsor Street; The tube station entrance; Pretty pink flowerbeds at the Civic Centre (well, I liked them).  Ruislip: Some old buildings in the High Street; The even older Manor House.  Eastcote: A shop that hires hats (run by a lady called Felicity).  Pinner: A dull photo of the not terribly interesting River Pinn.  Harrow: Hang on, I appear not to have taken any photos in Harrow (but then the marathon missed all the good bits).  Wembley: The closest the 1908 runners got to the new stadium.  Harlesden: Caribbean fish shop (serving mysterious Caribbean fish); The Jubilee Clock (plus 999 personnel); The Willesden Junction Hotel (nice lettering).  Old Oak Common: A fairly spartan cafe (with washing line); Sidings full of old decaying railway carriages; Site of 1966 triple murder (in front of burnt-out council house) (story); Wormwood Scrubs prison.  White City: Monolithic newish BBC building; The BBC Media Village (not the interesting end, sorry, because photography's banned). I may go back later and delete the photos you thought were the boringest, so click carefully. WHITE CITY (26.2 miles): I've arrived at the 1908 Olympic marathon finishing line (or thereabouts, because there's no plaque marking the royal box. It's hometime at BBC White City, and streams of trendy meeja workers and smiley secretaries are pouring out of the Broadcast Centre and either heading home or hanging around for a pint. 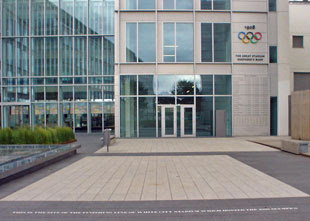 The Olympic rings (1908) are commemorated on the outside wall of the One Show studio, while in the window above is a large cardboard cutout of The Stig. And below in the courtyard are volunteers at a trestle table welcoming stragglers in a special centenary marathon, some jogging in with arms aloft for a celebratory Coke, others biking to a halt with a broad grin. Seems I've not been the only one out on the old course today. I desperately want to take some photos but I can't, because signs tell me I need the prior permission of the BBC (paying the licence fee not good enough, eh?). It's strange sitting in the middle of a busy place of work, once an Olympic stadium, especially when back home in Stratford it's going to be the other way round. My feet are aching now - I reckon I walked half of the 26 miles and bussed the rest. Major respect for all those who ran the distance both today and 100 years ago. Think I'd better limp out of shot before Adrian Chiles shines his big red spotlights on me. WEMBLEY (21 miles): Ah, that famous sporting arena, forever associated with the 1948 London Olympics. But forty years earlier there was no stadium, no athletic epicentre, just a fledgling suburb on the edge of a growing city. The 1908 marathon runners would have run within 400m of the future stadium site, but never noticed. As a multiethnic crowd arrived from all corners of the globe, they'd feel very much at home in Wembley High Street today. Here there's an unmistakable Asian feel, with mothers in saris manoeuvring pushchairs while off-school babes flounce from clothes shop to nailbar. Further down the road in Harlesden the vibe switches to mostly Afro-Caribbean. Supplies of jerk chicken are plentiful, pumped reggae fills the streets and salons dispensing specialist haircare and beauty products are everywhere. Some of the buildings may be the same, but a century of change has altered this corner of London forever. OK, enough buses, time to walk down to Wormwood Scrubs and the finishing line at BBC White City. PINNER (15 miles): I've been travelling through the affluent suburban fringes of northwest London, along green avenues lined by bright brick villas and mock Tudor domestic castles. Very few of these would have existed 100 years ago, just the odd village and farmstead along the way. But the Metropolitan Railway had just penetrated peaceful Ruislip and sleepy Eastcote, and the residential explosion was about to begin. Now the hedges along the marathon route are well-trimmed privet, not brambly bushes, and the grass is millimetre-perfect lawn, not bovine meadow. Residential nirvana, for those lucky enough to be at home today, is sitting on the back garden patio under a fringed parasol, sipping iced Pimms or an Earl Grey. Well-behaved sons cycle down to the park with fluorescent cricket stumps packed in their rucksacks, while dainty daughters in flowery dresses ask Mummy politely for an ice cream. As an Eastender used to bustle and densely-packed grime, I find the affluent atmosphere alien and alluring. Pinner is as far north as the marathon route extended. I fear it may be downhill from here on. UXBRIDGE (8 miles): From Slough it's a long pedestrian-unfriendly slog up the A412 dual carriageway. 1908's marathon runners would have found the going rather easier - a pleasant rural jog through fields and pinewoods - but I've had to yomp along narrow roadside verges and even down the central reservation. In the commuter village of Iver Heath, after six miles on foot, a rare bus was passing so I decided to cadge a lift to Uxbridge. My extortionally-priced ticket took me over the twin streams of the M25 and the Colne, one considerably prettier than the other. In the main town it's now lunchtime. Office workers with dangling laminated security passes pause to queue for a Meal Deal with Diet Coke, while sweaty shoppers exert minimal effort to walk between one shopping mall and the next. Windsor Street's boutiques sell flowers, handbags and lingerie to the more discerning. Quickly my route passes back out of town, alongside the common, heading north towards Ickenham. Time to put my Oyster card to good use, I think. SLOUGH (3 miles): After the historic calm of Eton, this much maligned modern town comes as a big contrast. The marathon route passes shiny glass service industries on the outskirts, then threads through the bustling High Street. Workmen are busy digging up the pavements and piazzas while a multicultural band of shoppers stuff themselves with muffins and pastries. There's nothing like t-shirt weather to bring out the full scale of Britain's obesity problem. One cafe-bar has dubbed itself Wernham Hogg in honour of Slough's most famous fictional paper company. Patrons are already drinking cooling pints and milkshakes at its shaded aluminium tables. Great for shopping, but Slough's other delights lie well hidden. 100 years ago the Olympic runners ran through here very fast indeed. I think Sir John Betjeman would have approved. WINDSOR CASTLE: The 1908 Olympic marathon started from the East Terrace, but it's clear I'm not going to be able to get there without forking out some exorbitant admission charge. The entire south, north and east flanks of the castle are sealed off from the public (courtesy of Section 128 of the Serious Organised Crime Act 2005) so I'm stuck on the western side with the tourist swarms. Several foreign parties have already passed by, following grinning guides holding raised umbrellas, and snapping away with their cameras at every stretch of crennellated rampart. There's a considerable but discreet police presence around Castle Hill - I wonder if Her Maj is in residence. As the low flying jumbos scream overhead, and this sun-drenched tourist town prepares to welcome thousands more t-shirted guests, I'm starting my commemorative marathon journey outside the main castle entrance. Only 26 miles, near enough, to go. On Friday July 24th 1908, London hosted the second most important marathon race of all time. It wasn't as important as Pheidippides' Ancient Greek original, obviously, but the London competition set the standard for all modern marathons. Previous marathons had been run over 25 miles, near enough, according to location. But the distance run in London - 26 miles and 385 yards precisely - has since been adopted as the official distance worldwide. And it's all thanks to our Royal Family being a teensy bit selfish. The 1908 Olympic Stadium was built just north of Shepherd's Bush Green at White City (then home to the Franco-British Exhibition, now the site of the BBC Media Village). Marathon organisers needed an appropriate starting position 25 miles away, and settled eventually on Eton College way out to the west. The fifty-or-so runners would gather on Barnespool Bridge and then run their way through the Middlesex countryside to the London suburbs. But King Edward VII was keen that the race set off from nearby Windsor, so the race was extended backwards across the Thames to start outside the famous castle. And not the front of the castle either, but the East Terrace round the back, starting just beneath the window of the royal nursery. How lovely, thought the Princess of of Wales, if my children could see this marvellous race begin. So the marathon became 26 miles long, not 25, for the benefit of a five princes and a little princess. Meanwhile, at White City, further royal moves were afoot. The marathon was due to end inside the stadium at the same finishing line as for the other athletics races. You can still see that finishing line today, etched out in a BBC courtyard (assuming you work for the BBC, that is, or can walk past their security guards unchallenged). But Queen Alexandra wasn't happy with the status quo. She wanted a proper view of the finish, except that her Royal Box was positioned a short distance away (in the wrong direction). Two choices - either shift the Royal Box or shift the end of the race. You can guess who won. In the words of the official Olympic report at the time, "385 yards were run on the cinder track to the finish, below the Royal Box." Total marathon length - 26 miles and 385 yards. And that distance stuck. The 1908 Olympic marathon was memorable for another reason - its extraordinarily controversial finish. As the runners entered the stadium, the Italian Dorando Pietri was in the lead. But he was extremely tired, staggering erratically towards the tape, and many onlookers feared he'd not reach the end without collapsing. A few well-meaning officials nudged and supported him towards the finishing line, to rapturous applause. But this thoughtless assistance got Dorando disqualified, and his gold medal was given instead to American athlete Johnny Hayes. Public outcry ensured that the Italian was not forgotten, and Princess Alexandra presented him with a commemorative gold cup shortly afterwards. But I bet she kept very quiet about the fact the the race would have been a mile and 385 yards shorter had her relations not interfered, and Dorando would have won outright with ease. That's how the start and the end of the 1908 marathon panned out, but the route inbetween may also surprise you. The selected course didn't spiral round the sights of central London like the modern television-friendly event, but instead traversed the capital's rural fringe. First stop Slough (mmmm), then Uxbridge (oooh), and then a mostly Arcadian jog through quiet villages like Pinner and Eastcote. I bet it's not such a peaceful route 100 years later! So tomorrow, on the anniversary of the great race, I thought I'd find out. I'm going to attempt to travel all 26 miles and 385 yards, for real, with the aid of a decent pair of walking shoes and an Oyster card. I'll see you in Windsor in the morning, and let's hope I'm not stumbling with exhaustion by the time I reach White City. 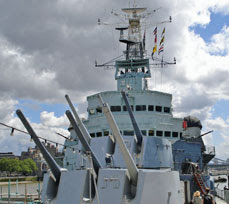 I must have passed HMS Belfast scores of times, thinking it couldn't possibly be particularly worth a visit. I mean, it's just an old warship dumped in the Thames, and since when was a mothballed naval vessel interesting? But I was persuaded by visiting family members to give it a try, not least because two of them were still young enough to visit absolutely free of charge. And what do you know, it's fascinating. The whole multi-deck experience was like a cross between a museum and an assault course - perfect for keeping a couple of boys engaged and active. And all this plus a great view of Thames-side London too. Come on, down the gangplank. It soon became obvious that mid 20th century warships didn't really do stairs. Steep ladder-type ascents yes, but gently-rising staircases no. You won't get up to the first gun turret in heels, that's for sure, but we were a testosterone-only party so we scrambled up with ease. Then through a doorway into the massive ship, along the main deck past a huge torpedo and some fairly unconvincing mannequins. We listened to our audio wand commentary relating not-quite thrilling stories of the laundry, the chapel and the mail room, and we hoped that the historical thrills picked up soon. They did. No young children under four foot beyond this point. Youngest nephew was delighted to discover he was a few inches over, and we headed off down two steep ladders into the bowels of the ship. Voila, the boiler room - capable of being sealed off from the rest of the ship in case the steam ever erupted into an uncontrollable explosion. 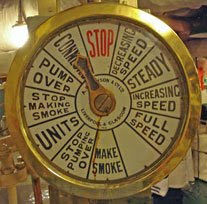 It's proper pipe-y down here, with valves and wheels and dials (and an informative video recording explaining how the stokers did their job). And just when we thought the designated route might be ascending back to the main deck, no, it was right back down again into the claustrophobic engine room nextdoor. It's not every day you get to clamber around a series of metal chambers in the middle of London below the level of the Thames, and we relished the opportunity. Upstairs was still full of dodgy plastic soldiers, cooking plastic vegetables in the galley or hanging from ropey hammocks on the messdeck. There were also a couple of small museums, not quite interactive enough to entertain the youngest but still a necessary part of the experience. HMS Belfast, we learned, was a town-class cruiser commissioned four weeks before WW2 erupted, and survived only a few months into the war before being crippled by a single magnetic mine. It took three years to make her seaworthy again, just in time to protect our Arctic convoys and take the lead in the D-Day landings. 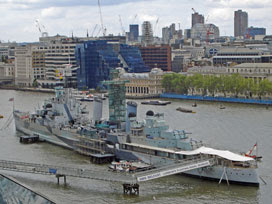 She then saw post-war service in the Far East, before finally being saved from scrap and relocated in the Pool of London as a museum ship in 1978. Yes, it's OK kids, we can leave the museum now and go for a couple more scrambles down to the steering chamber and the magazine. Eventually we climbed back out into the fresh air on the boat deck. It was impressive to stand at the front of the ship, beside chunky snaking anchor chains, and to look back towards the main gun battery. Photo opportunity now, boys. And one last ascent, this time right to the top of the ship via the bridge and wireless office. An opportunity to see the slightly more luxurious officers' quarters and lots more guns, plus an excellent view of the Tower and Tower Bridge from the highest platform. We were, by now, experts at scurrying up and down near vertical steps, which was just as well because there were several more sets here. We gave the cafe a miss, sorry, because we had Borough Market in mind as a more discriminating lunchtime experience. So once the final audio history snippet had played out, we handed in our guides to the smiling officers on the quarterdeck and trooped back up the pier to the gift shop. Such restraint, not even a novelty captain's hat or a souvenir pencil sharpener. And we were pleasantly surprised to discover that, without trying, we'd spent nearly two and a half hours touring around London's finest maritime time capsule. How many times have you been past without exploring inside? I eat chicken in a garage. The combined masses of the Women's Institute eye me quizzically. "We've heard so much about you," they say. I wonder if they have ever seen a male under the age of 50 at one of their events before. "Would you like a stuffed olive?" I have accidentally arrived in the village on the weekend of the annual WI Safari Supper. 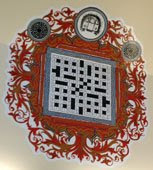 Four courses from starter to dessert, in four different locations, sequenced according to which committee member has the biggest conservatory. Only ten pounds a ticket, and husbands and hangers on are welcome. How better to spend a Saturday evening? I find myself standing in a thatched cottage surrounded by women in flowery blouses. I stick close to my Mum, because in this environment she's the only coherent identity I possess. As each new couple enters through the low-beamed dining room they look at me with temporary bemusement, then turn to talk to the regulars. I sip my sherry a little faster. A dear lady, who I later discover is 90, beams at me from the wicker chair in the corner. I am briefly introduced to the elegantly coiffured chairwoman as she and her husband glide past, effortlessly meeting and greeting. Maybe wearing Reeboks wasn't a good idea. I attempt to make endearing smalltalk with our hostess. "Lovely garden you've got here." I think I'm winning. The safari progresses. Prawn cocktail is served in the big house up the lane, in a room packed with ornamental owls. I find it nigh impossible to scoop up the saucy lettuce with only a small teaspoon. Thankfully everybody else is having similar difficulties. I can only smile and nod as the assembled company discuss ten bob notes and Marion's operation. A yomp across the village green builds up my appetite for the main course. "Are you the last?" asks a man in the driveway. He's wearing an algae-green suit and clutching a choice of wines. I am ushered into the garage to sit at a cloth-covered picnic table. All the lawnmowers, hacksaws and jamjars full of nails are carefully hidden behind a makeshift screen of clothes-pegged blankets. I await my chicken. "I've booked the peacock man as one of our speakers next year." This is not going to be an easy conversation to take part in. Eventually the headmistressy lady to my right attempts to engage me in dialogue. "You're from London, then?" I hope she hasn't deduced this because I'm holding a knife in my hand, even if it is only lightly serrated. We discuss the treasures of the British Museum until our plates of gravy-soaked poultry arrive. One last stop, for dessert. The spread of creamy pavlova, creamy gateau, creamy trifle and creamy profiteroles (all with optional additional cream) explains why so many husbands have agreed to attend tonight. We sit in the conservatory and go back for thirds. It is going to be a long night. Back in 2002, central London was filled with fibreglass cows. 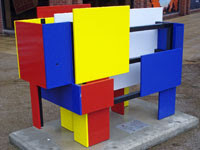 More than 100 bovine sculptures were scattered around the capital, each decorated with a different (often humorous) colourful design. Well now it's elephants. 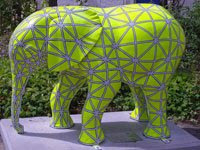 There are more than 50 be-trunked creatures dotted around the city, in streets and parks and shopping malls. One's on a theatre balcony, one's in the corner of a restaurant and one's in a department store doubling up as a very-pink nailbar. The designs are as weird and wacky as ever, including a brick-painted Camouflagephant hiding up an alleyway, a Go-Green Elephant with three bottlebank holes for recycling, and a Buzzophalant which looks distinctly like a bee. Or you might prefer the double decker bus, the one in football kit or the one with a Tardis on its back. I spent much of yesterday afternoon, inbetween the showers, tracking down the elephants with the aid of a downloaded map. Some were hard to find, others rather easier, often because they were surrounded by grinning children. It was clear I wasn't alone - a number of families and tourists were out following the trail too, leaflet in hand. 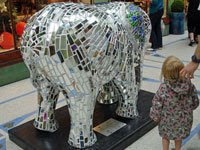 The most popular elephant was probably the mirrored specimen in the Royal Arcade (bottom left), which was forever being stroked and photographed. I rather liked the bright yellow elephant in St Giles (top right), and also the more abstract 'Parallelephant' in Theatreland (bottom right), the latter recently restored after vandals made off with its plastic ears. 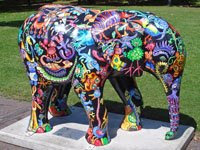 If you're interested in seeing the menagerie for yourself, you'll find all the details on the Go Elephants! website. Quick, before they sell them all off for charity at the end of August. Or you could investigate pictures of the entire herd here, most of the herd here, or quite a lot of the herd here. Oh, and one other thing. The city in question isn't London, it's Norwich. Because not everything that's great and arty happens in the capital (but I bet some of you wish it did). I travelled up to Norfolk by train yesterday. Seven stations in ninety minutes, all pretty much on time and without incident. But one thing about the journey repeatedly niggled. A few minutes before each and every station stop, the chief steward delivered the following announcement over the tannoy. And I wish she hadn't. Ladies and gentlemen we will shortly be arriving at <insert name of station>. Change here for services to <somewhere> and <somewhere else>. If leaving the train at the next station please make sure that you have all your possessions with you. Please use all available carriage exits, making sure that you close doors and windows behind you, and ensure that you take your ticket with you when you leave. Actually I can't guarantee that's the precise wording she used, but I heard her spiel often enough to know I've got the gist right. It was obvious she was reading every time from a pre-determined script, or at least had delivered this speech so frequently that she knew every word by heart. More to the point, I'm sure the speech didn't used to be this long. The operating company have been adding in extra instructions, and even more extra instructions, presumably because they think we're so stupid that we need to hear them. Where will it all end? OK, I don't mind that bit. It's not always obvious what the next station will be (are we stopping at Stowmarket or not?) and platform signs aren't always legible enough to be read from inside a carriage. And that's OK too, especially for infrequent travellers. Because, you know, somebody might actually be going to Lowestoft or Harwich or Bury St Edmunds for the very first time. I never leave a train carriage without thinking "do I have all my possessions with me?" I'm able to do this because I'm a responsible citizen, and I don't need repeatedly reminding like I'm an blundering amnesiac. In particular I don't need prompting at every single station, on every single train, every time I travel. I know it's important that unattended hand luggage is avoided at all costs, because any ensuing police operation can cost huge amounts of unnecessary time and money. But surely we've all now heard this message so often, so frequently, that it goes straight over our heads, with zero impact, its meaning totally unnoticed, and ... oh damn, I think I just left my laptop on the train. You what? This Inter City carriage has two exits, one of them closer to my seat than the other. What are the chances that I'll accidentally head towards the wrong exit, the slow exit, and won't notice? Really, surely, this part of the message is completely unnecessary? OK, I know that closing the doors saves a lot of time. If I don't slam the door shut then the poor guard may have to walk miles up the platform to close it before the train can depart, slowing the service and creating unnecessary delays. But closing the window too? Erm, why? Opening the window is part of the inefficient door unlocking mechanism, so why force us to close it again afterwards? Are they worried that the rain might get in or the central heating might get out? Really, aren't there better things to nag us about? ...and ensure that you take your ticket with you when you leave. Oh come on, now you're just taking the mickey. Do people really leave their tickets on the train, thinking "oh, I bet I won't need that"? Or do naughty people try sneaking through the ticket barrier by saying "oh sorry, I had my ticket checked on the train so I thought I'd leave it there"? I think not. Honestly, whatever insane extra request will they decide to add next? Customers and stakeholders, we will shortly be arriving at <insert name of transport node>. Change here for other services with equally annoying on-board announcements. If leaving the train at the next station please make sure that you take any unexploded baggage with you. Please exit via a door, not a window, and slam it behind you taking special care not to smash your fingers. Please do not vomit on the floor on your way out, or carve your initials in the back of the headrest, or spit on your fellow passengers, or run amok in the carriage with a large machete. Please continue to breathe at all times, and thank you for travelling with National Express. I live in fear that, even by the time I travel home, something similarly ridiculous may have come to pass. I don't normally travel home via Stratford station, but I did yesterday (hi Mum, I've pre-bought my train ticket, I'll see you later). The Central line platforms were the usual mass of scurrying humanity, the subway was a typically frenetic scrum, and the queues at the ticket barriers were as nightmarish as ever. Up on the DLR/Jubilee overbridge, however, I managed to time my arrival for one of the quieter interludes between outpouring trains. And I was pleasantly surprised to discover that the station's upper concourse has been transformed, for a few months only, into a very local museum. The Stratford Hoard is a series of collections of ordinary objects, such as picture postcards or milk bottles, each contributed by somebody who works at the station or lives nearby. The objects are presented with due reverence in museum-quality cases, elevating what could be a mundane assortment of items to a position of perceived importance. Imagine if you will the highlights of Elizabeth Parker's collection of sugar sachets, pinned out across four separate display cases like an array of mounted butterflies. Or Kacey Young's collection of souvenir teaspoons, comprising ornate silvery-plated treasures from various locations around the world. Or the scarily-oversaturated world of Martin Kingdom's picture postcard graphic wall, reliving the long-gone era when holiday messages took even longer to travel home that you did. Or teapots. 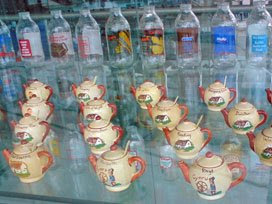 Susan Langford collects tiny red-spouted Manorware teapots inscribed with the names of British tourist towns. They're usually kept at home and brushed occasionally with a duster, but for the next few weeks they're in pride of place in a glass cabinet beside the entrance to the DLR platforms, just behind a row of late 20th century printed milk bottles. It's a great idea, this exhibition, celebrating the way that ordinary people celebrate the ordinary by collecting it. I'm almost sorry not to have contacted the curator myself and offered him the loan of my collection of early-1980s chocolate biscuit wrappers. I'm sure the good people of Stratford would have enjoyed remembering what a shiny-coated blue Penguin looked like, and ogling a pristine Trio, and gawping at a pair of long-gone Uniteds (original and orange). Ah yes, sssh, there's a collector in many of us. As part of the project's official launch yesterday, an additional freesheet newspaper was being handed out to passing commuters. This was Issue 1 of The Stratford Grapevine, an arts-sponsored community newspaper 'by and about the people of Stratford'. Yes, I know, it sounds awfully worthy and dull, but the reality is far better than that. Pride of place is given to a series of articles about the Newham Striders, a well-established healthy walking group, who recommend a few non-standard strolls around the local area. There are reports about the West Ham Allotment Society (Nina recommends them too), the imminent retirement of Stratford's favourite independent tailor and the disappearance of Robert the steam engine. Throw in a Forest Gate Punjabi radio station, a Gerard Manley Hopkins plaque (in a supermarket car park) and a competition to try to find the perfect match for Olympic Fence Blue, and you have a surprisingly interesting package. Issue 2 is due out in September, and Issue 3 in November. As another DLR train arrived and disgorged its Docklands cargo, I stood back to let the Essex hordes storm through. It was reassuring to see many of them accepting a Grapevine in preference to a London Lite (I know which I'd pick, given the choice), and then sitting reading about E15 rather than W1 on the train journey home. The 20-page tabloid can still be picked up from Stratford station for the next few weeks, or else you can download the pdf and read it at home. 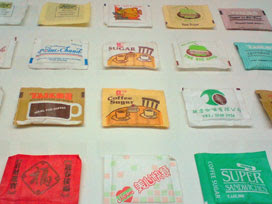 But for the sugar sachets and teaspoons you'll have to turn up in person.